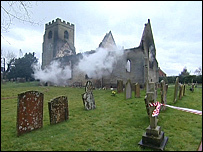 A medieval church in Warwickshire has been severely damaged by fire. The blaze began in the early hours at St Nicholas' Church, in Radford Semele, near Leamington Spa, and at its height about 50 firefighters were tackling it. Warwickshire Fire and Rescue Service said the building had been left structurally unsafe. An investigation has begun into what caused the fire. Parishioners held their Palm Sunday service in the village community hall. Firefighters said the bell tower appeared to have been saved but were worried the gable end might blow over in a strong wind because of the structural damage. Parts of the church date back to the time of the 11th Century Domesday Book. The fire service said because parts of the wooden floor were still smouldering it might be two days until firefighters are able to access the building.